Figure 4: Standardized experimental periods for exposure to isoflurane. Note: (A) Isoflurane exposure that is limited to under 20 minutes allows for molecular and behavioral experiments to be conducted between 6 and 72 hours post-surgery/ post-exposure. 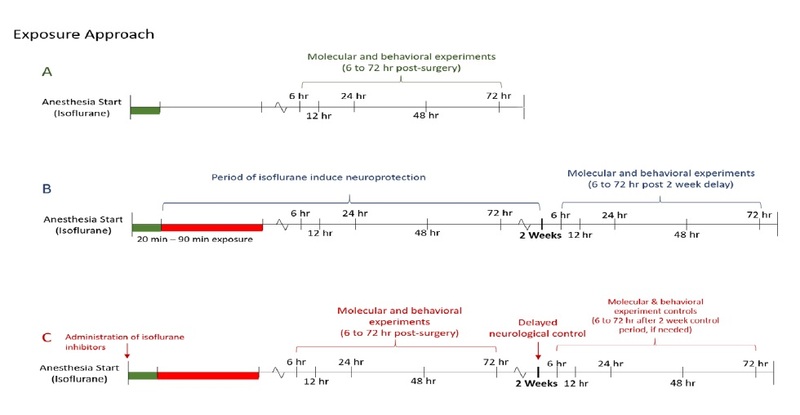 (B) With exposure to isoflurane during surgery greater than 20 minutes but less than 90 minutes, experimental data should be evaluated after two weeks to ensure that neuroprotection from isoflurane has dissipated. Molecular and behavioral tests can be conducted 6 to 72 hours post 2-week isoflurane neuroprotective window. (C) Utilization of apoptotic inhibitors, such as VPC23019 and wortmannin,10 before administration of isoflurane, when the exposure ranges from 20 to 90 minutes. Molecular and behavioral experiments should be conducted from 6 to 72 hours post-surgery/post-exposure. hr: Hours; min: minutes.